You probably know that a child’s baptism is one of the most important days not only for the child but also to its parents, relatives, and the child’s Godfather and Godmother. But, planning the best baptism gifts isn’t gonna be a piece of cake. 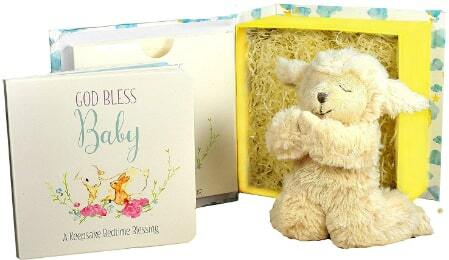 Lucky for you, here we have 101 Baby baptism gifts for boys and girls. So fasten your seatbelts and enjoy the ride! 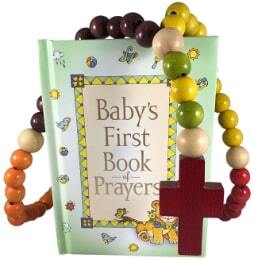 Including a wooden rosary and the Baby’s First Book Of Prayers, this is the most appropriate gift for a simple introduction to the Roman Catholic faith. It is also a very natural gift for a child’s baptism day. 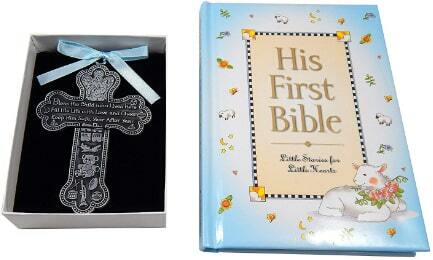 You are likely to find The Bible when you are looking for baptism gifts for boys. 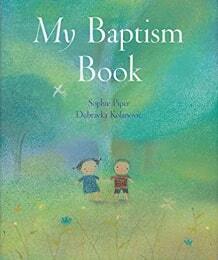 Baptism gifts should surely include The Bible. While growing up, the baby realizes the worth of the book that was given to him by his favorite uncle or aunt. The young one’s first step is undeniably one of the happiest moment in any parent’s life. 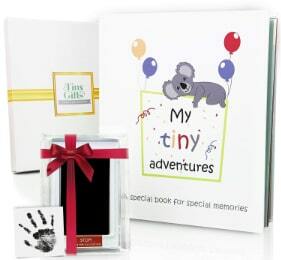 Gifting the baby handprint and footprint kit would capture the admired one’s first step which would be a life-long memory for the child and the parents. 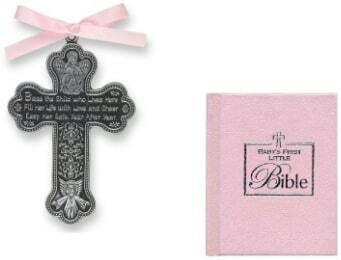 This scripture kit includes Baby Bible for girl child and crib cross. The scripture, in the later years, helps the girl child to embrace the love of God and accept Christianity as her way of life. The baby princess is not complete without her right shoes on her special day of baptism. 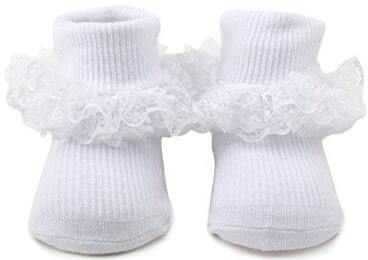 These baptism shoes are the best option for baptism gifts for girls. These shoes are soft, light-weight, anti-slip sole and specially designed to make walking feel natural for the young toddler. 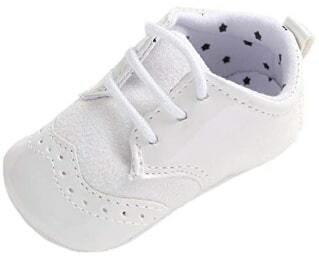 These shoes clearly are one of the best christening gift ideas. 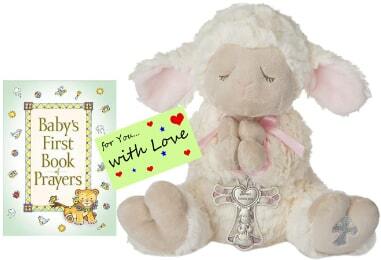 This baby baptism set comprises of a toy lamb which recites the prayer “Now I lay me down to sleep” when pressed on its belly, a bedtime storybook, and a keep-safe gift box. 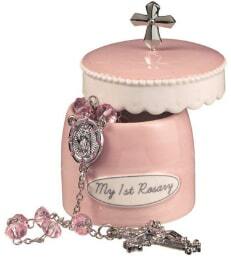 It is a great Catholic baptism gift and will be helpful in collecting cherished memories. 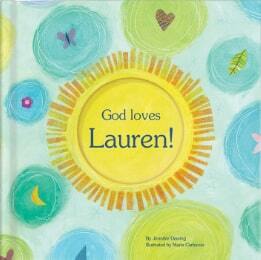 The book includes a list of poems dedicated to God and helps the young one understand the love of God. 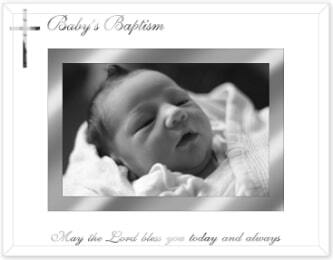 It is a meaningful gift for the baptism of a newborn and the parents will appreciate the gift for the years to come. A keepsake box makes an ideal christening gift idea because it helps the baby girl to store her memories in the form of mementos to cherish in her later years. 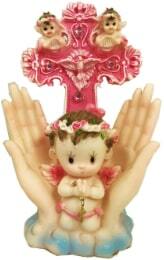 The gift also comes with a rosary for the baby girl. 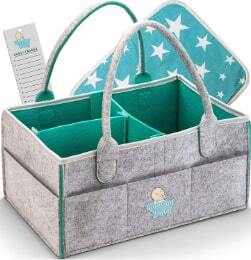 This Keepsake box is blue in color and is designed for a baby boy. 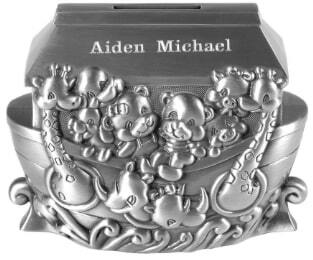 A keepsake box stores the memories of the baby boy which he will make over the years. The box comes along with a rosary for the baby boy. Your Godson deserves something significant so that he remembers his Godfather or Godmother every time he sees it after he grows up. 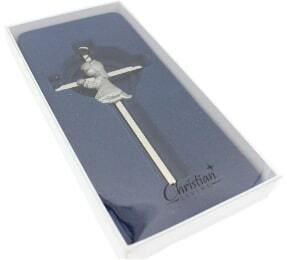 Gift him this glass cross and mention how much you mean to him. Having a Goddaughter is a blessing and gifting her something would surely be a tough job. 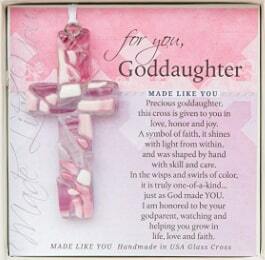 This Handmade Glass Cross comes with a message of faith that you want to teach your Goddaughter. Parenting could a mammoth task especially for those who are experiencing for the first time. 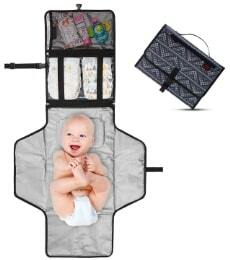 The baby diaper organizer can really be a great help for the parents and would be a well-appreciated gift for the parents. 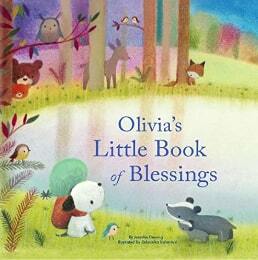 This baby book of blessings would help them to do so, with unique stories and poems, the toddler is set to understand the greatness of God and learn the basics of The Bible. The picture frame would be an apt gift for the baptism ceremony as it holds the picture that captures the special moments of the baby’s life. 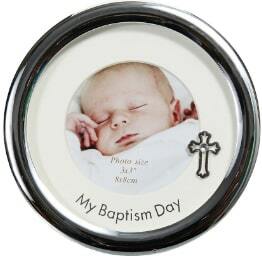 You sure can’t miss this when you find gifts for baptism. 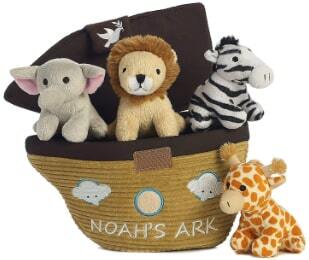 The child is definitely going to love playing with the animals on Noah’s Ark boat. As he grows up he would understand the meaning of the Ark and would love to know about the story of Noah’s Ark. Your goddaughter needs her best dress to look extremely gorgeous and now you have the chance to gift her your choice of dress. Look at the joy at her parents face after your princess look so beautiful in the dress which you have gifted. 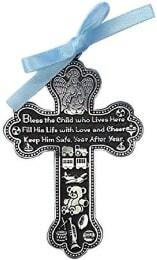 This baby boy cross medal has a beautiful prayer inscribed on it for your beloved baby boy. 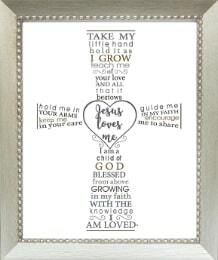 The cross is an adorable decoration piece used to make the house even more beautiful. As an uncle or aunt, it becomes your duty to teach your nephew or niece the art of saving money. It would be a great idea if a piggy bank that your gifting would be shaped like Noah’s Ark when you think of a gift for a Catholic baptism. “Blessed are the meek and the humble”- The Bible says. How much blessed is the child that is to going to be accepted by God? Well, this dress on your child will just as much blessed and adorable. The child’s first year is truly precious moments for the parents. With this collage, you can attach pictures of your child from every month of his first year and store it for the rest of your life. 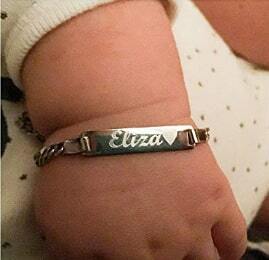 Can you imagine how the cute little wrist of your little princess would look with a bracelet engraved with her name? It certainly would be charming when given with love to the baby girl. Jewelry would make an excellent option for the young one to show your love. 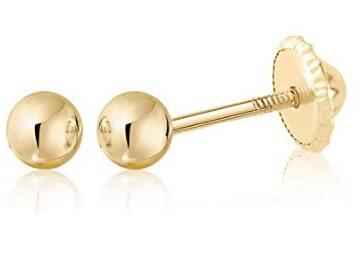 These gold earrings could be your pick for the junior for his or her baptism. Be it winter or summer, your toddler needs to be protected from the weather and what better option than giving them a blanket shaped like a stuffed animal? 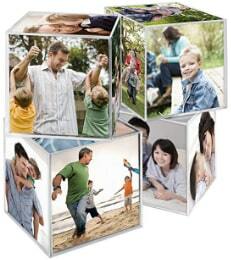 Storing the memories of your infant in a cube is one of the creative ways to remember your kid’s childhood. 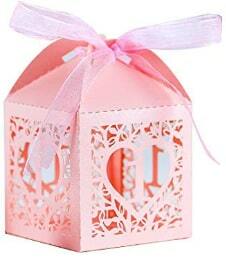 That’s why it is suggested by several people as a perfect gift to a baby baptism. 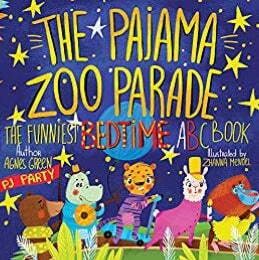 This bedtime stories book is most recommended by numerous parents as it has the best stories to help you put your toddler to sleep. Winter is just around the corner and you don’t want your baby getting sick. Do you? Babies always have to be kept warm and this sweater just does the trick. Baby feet, aren’t they cute? Well, it sure has to be kept warm on the cold mornings and windy nights. 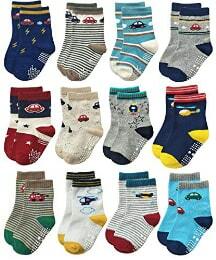 Choose different varieties of socks and gift it to your special loved one on his baptism. This blanket has a beautiful message printed for the child and also makes sure that the child is warm enough to sleep in the cold winter. As a Godfather or Godmother to the child, your message should be strong enough so the child remembers even after he grows up. Add a frame to your message and gift to your Godson or Goddaughter. 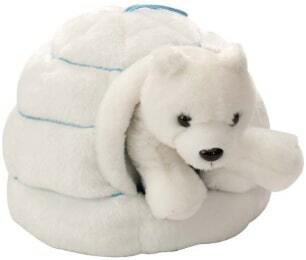 The child does need a companion to play with all the time and obviously, you cannot be available, gift this stuffed toy so that he is captivated playing with his new friend. Well, the young one has to be looked after constantly and has to be kept by his/her parent’s side most of the time. 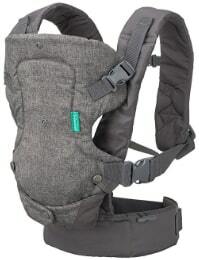 With the baby carrier, it is easier to manage for the parents and would certainly be appreciated as a gift. 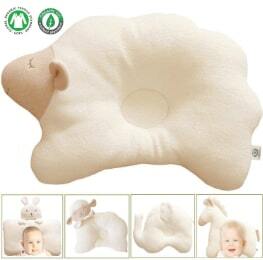 Comfort for the baby is one of the most important factors one has to look after, and gifting a warm cozy pillow would surely add on to the comfort of the toddler. 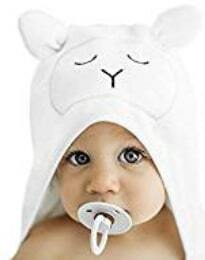 This adorable washcloth set comes with a hooded towel and makes the cleaning and your bonding time, fun for the baby after its bath. 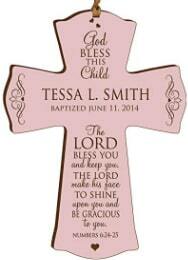 This decoration cross can be personalized and the name of the newborn along with the date of baptism can be engraved and gifted to the child. 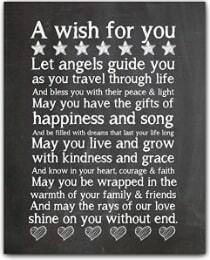 It also comes with a beautiful message for the infant. 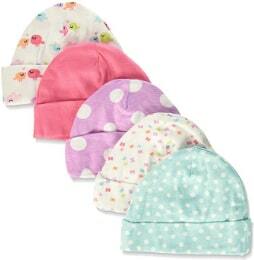 The cap is soft and made of cotton fabric doesn’t cause discomfort to the baby. 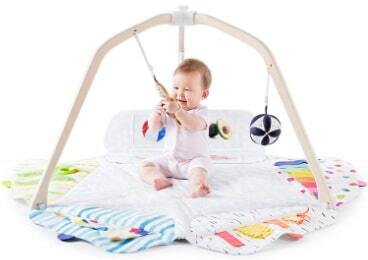 It is one of the must-have items on any parent’s baby shopping list and gifting it would just make their work easier. 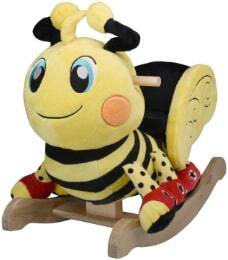 Kids do enjoy a fun rocker ride on their favorite stuffed animal every once in a while. Why not gift them this pleasure on their auspicious day and make it more delightful. Your beautiful princess on her baptism day would look even prettier with these headbands on her head. 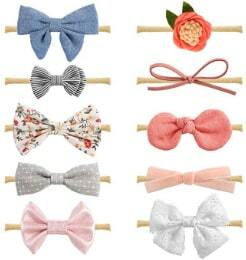 These headbands are smooth, adjustable to grow with your baby and also you have a lot of varieties to select from. 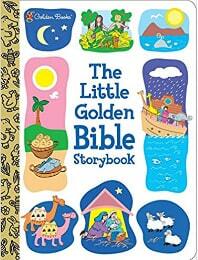 This little golden bible has simple retellings and stories of the bible for kids and can make bedtime stories more exciting and entertaining. 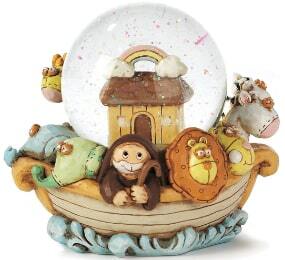 This water globe is made of resin and glass, hence it makes a beautiful decorative piece in a child’s room. It sure makes a good christening gift idea for a baptism ceremony. 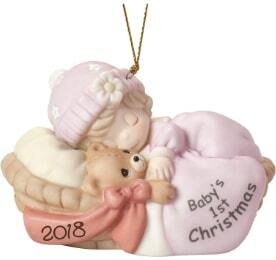 This baby girl ornament celebrates her first baptism and welcomes her for her first Christmas. 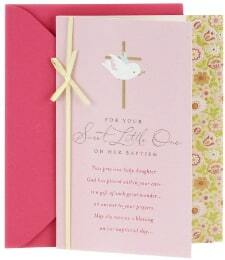 It is the best christening gift for the baby girl to enrich her presence in the family. 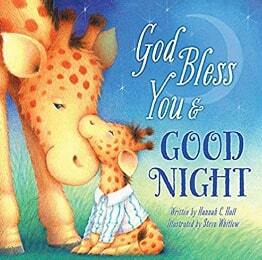 This book contains easily remembered prayers for the kids to be told in their bedtime and statements of Christian belief. Children’s learning ability is faster than you can imagine. This learning activity cube enhances the kid’s learning capacity along with amazing features like motion sensors which play different music, attracts attention, and encourages crawling. 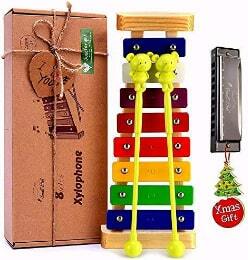 Kids need something that constantly engages their attention and this xylophone is a quite good idea in keeping their attention and entertaining them. Who knows it also may inspire the toddler in being a skilled musician? Traveling is an enormous task when traveling with a baby. Gifting this traveler set would make the parent’s job much easier with all the baby essentials on-the-go and make the journey simpler and calm. Kids like to mess around with food and presenting the parent with the feeding set would make their lives more peaceful. 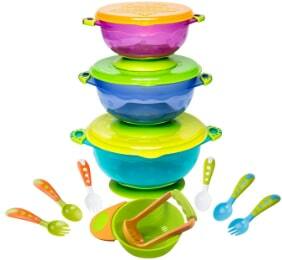 This feeding set contains everything you would need in feeding a baby and is convenient for the toddler to use. This baby photo album helps the parent to add photographs of their loved one in the form of a journal and let the parent explore how delightful their child has become. 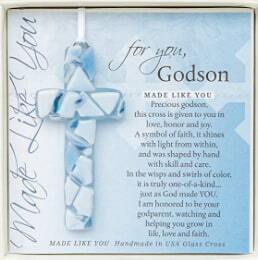 A perfect gift for the child on his First Communion given by their Godparents and family. 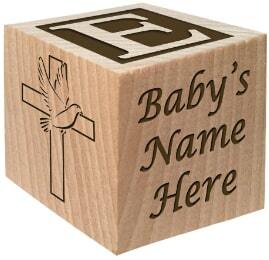 The baby block comes in different styles and can be personalized with the baby’s name written on the block. Parenting would be a great experience when you have the right essentials for the comfort of your baby. 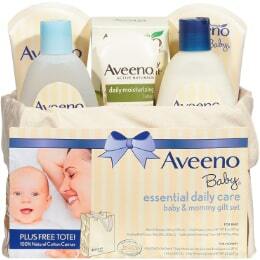 This gift set would ensure to nourish the baby and pamper moms with skincare lotions and bath products. Toys are the best way to enhance your child’s learning ability and with this wooden toy set, you can give your Godchild the best gift that he would enjoy. You certainly want to see your nephew in the best outfit you could imagine. Present him with the best attire you can find and adore him when he wears the outfit. Changing the baby’s diaper is going to be a piece of cake for the parents once you give them this diapering kit on the baby’s special ceremony. This bracelet can be from personalized to put your Godchild’s name with a lovely message to them on their First Communion and their Baptism ceremony. You heard it right, you can personalize this blanket with your loved one’s name and it specifically meant for gifting in a baptism ceremony. 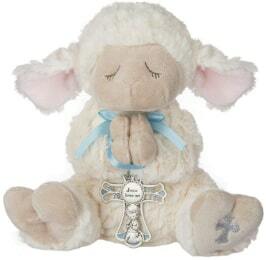 This serenity lamb comes with a crib cross which has the words “Jesus Loves Me.” It is designed for baby boys as it comes in blue color. 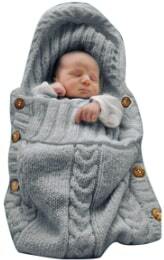 This sleeping bag makes sure that your kid is warm and comfortable and has the best environment for their cute little naps. 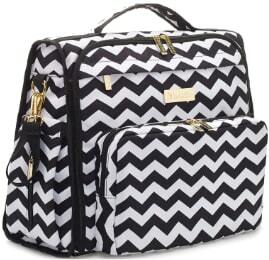 Organizing and carrying Diapers is made much easier with this diaper backpack. You can easily carry it while traveling and use it conveniently. 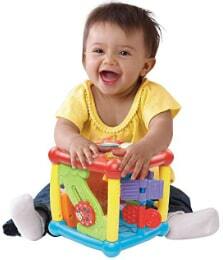 This play gym activity space is the best way to develop your child’s brain activity. 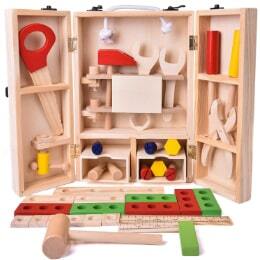 Make your toddler smarter and more active by gifting him this activity space. Bathtime for kids would more fun with this bathtub as it would attract more attention to the toddlers and make your bonding time with the kid more fruitful. Stuffed animals are the favorite for toddlers and when it is shaped like a blanket, it really does give a sense of security for the baby. 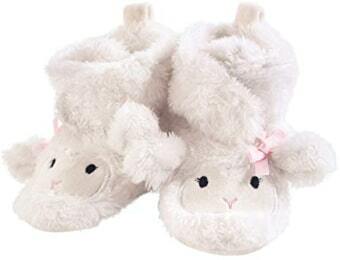 These lamb shaped booties are the best to keep your child’s feet warm. And won’t those shoes look adorable on them? 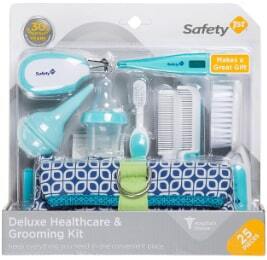 Your child’s healthcare is your absolute priority and with this healthcare and grooming kit you can keep him healthy and make him look just as charming you’d like. Feeding milk to the newborn is made easy by this baby bottle feeding set. 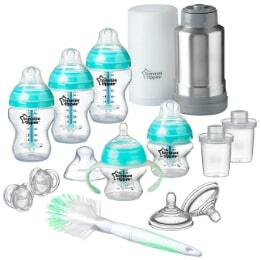 Make parents’ life manageable by gifting the child this bottle feeding set. Children do make a lot of mess when they are fed. This burp cloth is quite effective in cleaning up the mess on their clothes. Toddlers have a hard time sleeping if their clothes are not comfortable. 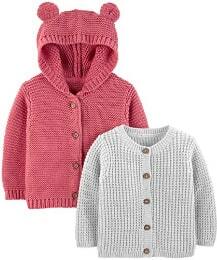 These cotton jersey are smooth and produce comfort for the kid. 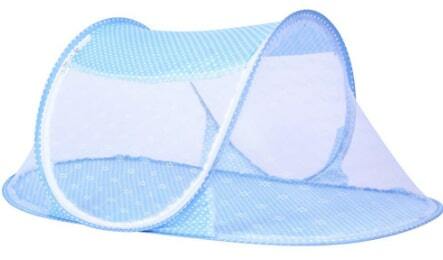 Protect your baby from harmful mosquitoes this season with baby’s mosquito net and let them have a serene sleep. Gifting jewelry is a wonderful idea for a baptism ceremony. 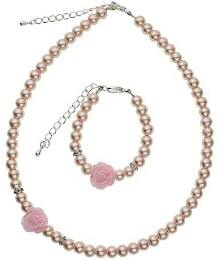 Necklace and Bracelet makes a perfect jewelry to present to your little kid. 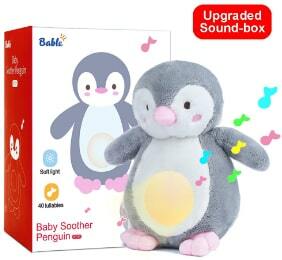 An excellent partner for your lovely little boy with whom he can cuddle and have a good night sleep with. 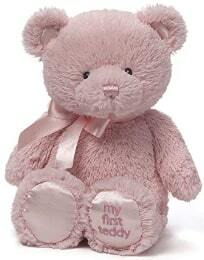 Your little princess really needs a partner to play with and who’s better than a Teddy bear to keep her company? 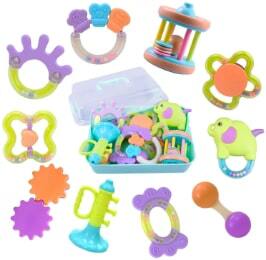 This teething set is the best gift for any teething infant. 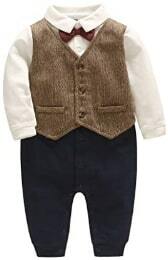 It is eco-friendly and you can combine this with your other baptism gifts. Restless young ones always need something to engage them with. 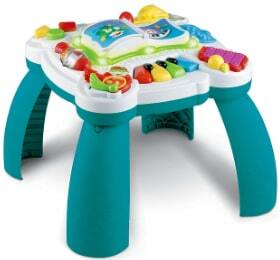 The musical table is definitely for these young kids to keep them occupied and help them have fun. The baby is about to learn to walk for the very first time in his/her life. 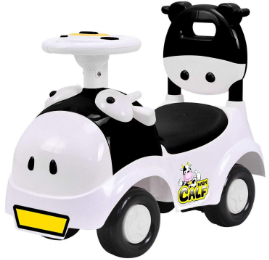 Make it happen earlier by gifting this learning walker to your Godchild. This sliding car is built such that it can be used as a pushing cart, walker and a low-seat ride. Walking couldn’t be made more fun without using this cart. 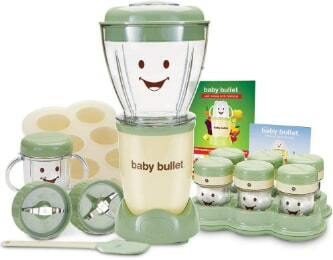 This system includes a complete variety of blender for the parents to make an entire week’s worth of nutritious food for the baby. 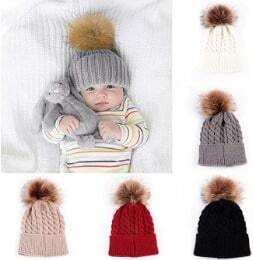 This winter, ensure that your toddler is entirely warm by gifting him these warm and cozy caps. 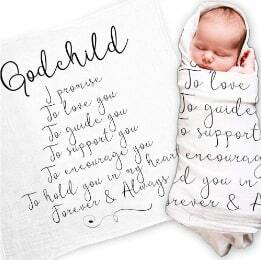 You can bundle this with your other baptism gifts and make the day gracious for him. Bible stories are the best stories to present your Godchild which makes him enjoy and learns about the religion eventually as he grows. 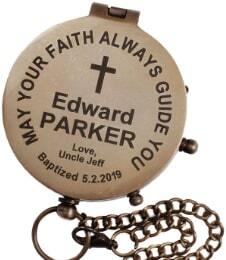 Your Grandchildren’s baptism gift should certainly memorable for them even after several years. This silver framed message delivers your sentiments when they grow up. Children attaining their milestones are parents’ happiest moments. 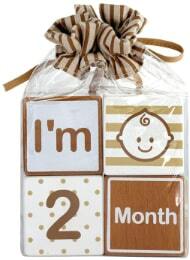 Now capture them and organize and cherish the child’s milestones with these age blocks. Baptism gifts include the cross as a reminder of Jesus and gifting it on baptism ceremony would enhance the sacredness of the occasion. This resin box with the rosary is an apt gift for christening or baptism ceremony which can be decorated in a baby’s room or curio cabinet. 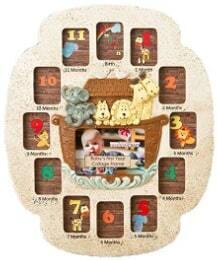 Place your baby’s Photo in this photo frame and make it a perfect treasured memory keepsake. It is the best gift for a baptism and First Communion. 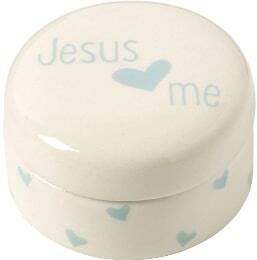 Place your sweet chocolates in this exciting favor boxes and gift them to your nephew or niece on their day of Baptism. Tell your baby girl that she will always remain an angel to you by presenting her this keepsake gift on her auspicious day. Sometimes, a simple card can send a strong and powerful message to the reader. Bundle your joy and happiness in this card and gift it to your princess. 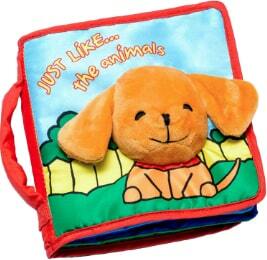 This book is made of cloth and gives an educational perception to your toddler. Read this to your toddler and have in your bonding time with them. With 40 lullabies for your baby, this light sleep aid doll is going to make your work easier in putting the infant to sleep. Gift this and make the parents and the newborn happy. 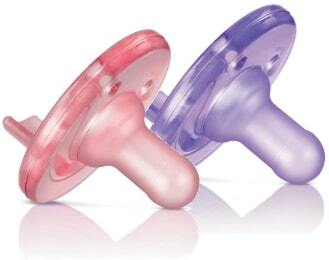 A pacifier simple solution to calm the newborn. 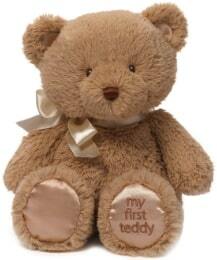 You can bundle this with your other gifts for the child’s baptism. 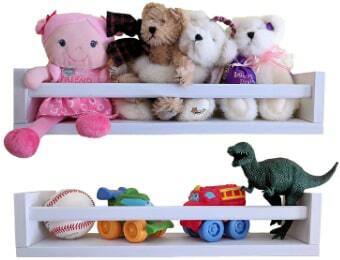 Help the parents organize their child’s room with this floating wall shelf. 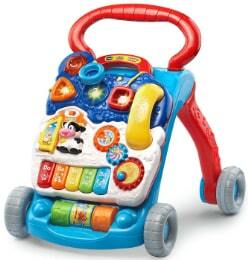 It may not be a baptism specific gift but it would surely help the parents managing their child’s toys. 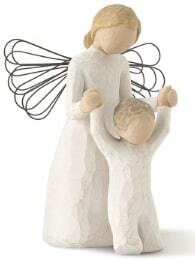 Baptism specific sculpted angels make an excellent decoration piece for the house and bless the occasion of the Holy Communion. 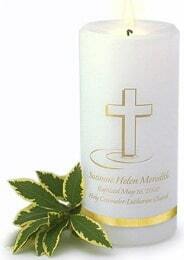 Engrave your child’s name on the candle and grace the ceremony with this special baptism candle designed for this occasion. 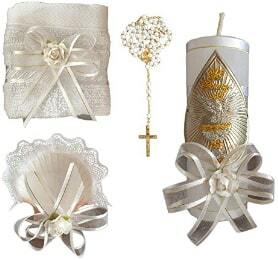 This christening kit includes all the essentials needed for your child’s baptism like Baptism towel, candle, rosary, and shell. 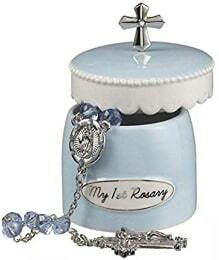 Rosary, bracelet, necklace and all of the religious accessories of the baby be can safely be kept inside this ceramic trinket box. 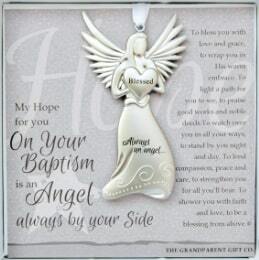 Make the occasion holy by presenting the baptism angel to the little child and make it a memorable day for all of the people. Bathtime made easy with this newborn baby gift set which includes skin care essentials by Mustela. 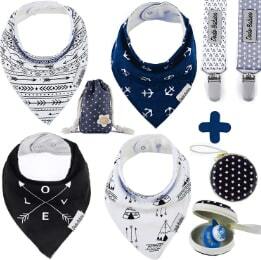 This set includes all the essentials needed for your baby boys like drool bibs, pacifier and a pacifier case wrapped in a gift box. 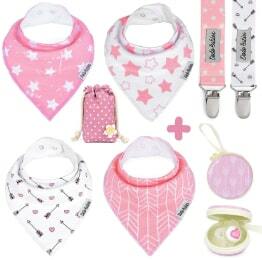 This set comes in a pink color variety for your baby princess and contains drool bibs, pacifier, and a pacifier case. Write down all your well-wishes and insert it in this jar. 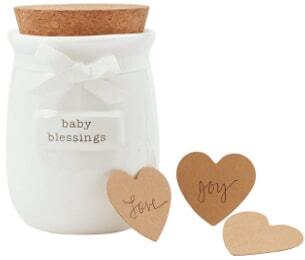 This jar comes with a removable lid and heart-shaped papers to write your blessings. 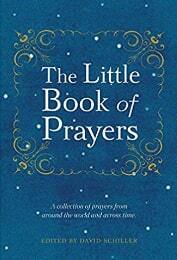 Teach your toddler the importance of prayers with this little book of prayers. 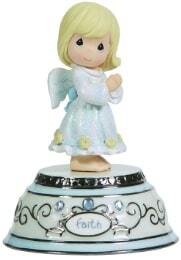 A bejewelled angel sings “Jesus Loves Me”, standing atop a silver base and her hands folded in deep prayer. The Faith Angel Music Box reminds the faithful of their duty to the world and is one of the most appropriate baptism gifts for babies. 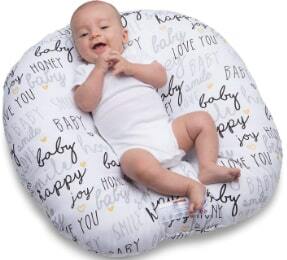 The Baby Lounger is a comfortable and securely designed cushion for your baby. It comes with a strap that you can use to carry it around. 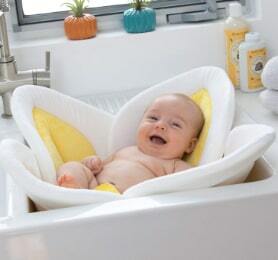 Convenient to use anywhere, it prevents the baby from falling out of or climbing out of it. Well, now that you have completed your journey you definitely should have got an idea for your gift to your favorite Godchild, nephew, niece or any toddler. Find your wallets and purses and start your shopping!